PARIS (AP) — Team Sky says the Tour de France trophy won by Geraint Thomas has been stolen from a cycling show in Britain. The team says police are investigating after the trophy disappeared during an event in Birmingham, where Team Sky displayed the three Grand Tour trophies won by its riders. In addition to this year’s Tour de France and Giro d’Italia, a rider for Sky also claimed the 2017 Spanish Vuelta title. 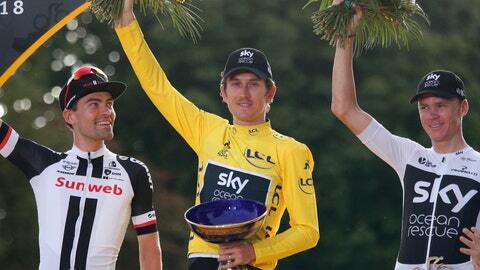 Thomas, who won his first Grand Tour title this year, asked the thieves to return the trophy.